Dr. Barry Holcomb is board certified in Pulmonary Disease, Critical Care Medicine, and Internal Medicine. He graduated from the University of Colorado Denver School of Medicine and attended an internship program at the same institution, where he also completed his residency. 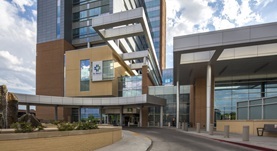 A fellowship in allergy, pulmonary disease, and critical care followed, at the Vanderbilt University. With a medical practice experience of over 40 years, Dr. Barry Holcomb is currently affiliated with St. Mary Hospital and Regional Medical Center in Colorado.